If you didn’t already catch it, I’ve added a page to the power supply section on grounding. This is a hard topic to do justice because there is no one approach, there are just approaches that work for individuals/projects. I try to give a rough outline of my thought process and strategy for grounding projects on the new page. Letters to WTF: What kind of rectification am I supposed to use with this power transformer? I was helping someone with an amp build over Telegram (chat app) yesterday when this question came up. He had in fact been trying to use a diode bridge with a center tapped transformer with both the center tap and the bridge grounded. He released the magic smoke from his transformer, though there were a couple of other issues that may have contributed to this. When I was starting out, I had some confusion with power transformers and rectifiers, too. Probably like many others, I started with small solid state circuits, where center tapped transformers are rare. Once I started building with tubes, the secondary ratings of center tap transformers were another source of confusion. So here’s a by no means complete rundown of transformer configurations. This write-up will have two parts. The first (the PSU) is posted and hopefully I’ll have the amp write-up done shortly. This project is the most ambitious one I’ve written up for the site so please excuse the omission of some of the finer calculations and details. Although the power supply is rather complicated, the amplifier will be pretty straightforward (pinky swear). The supply can be used with other amps and the amp can be used with other supplies, which is one of the reasons I decided to split it into two pages. Click here to descend into the madness! What is your opinion on rectification? Tube vs SS rectification is a hotly contested topic in the audio world and what I tell you will be opinion. That said, I’ve used both and never had a problem (eg here, here, here, here). When designing from scratch, my choice is dictated by my power transformer, space available on the chassis, and whether a tube rectifier is in the budget. Sound quality is not really a consideration. Of all the parts in a Class A single-ended amp that contribute to the sound, I think rectification is one of the least important. If you end up with the right B+ voltage and you filter it so that there is no ripple, you’re 99.9% of the way there. The debate about tube vs SS rectification usually focuses on theoretical advantages or disadvantages without respect to whether a supply is well-designed and implemented. 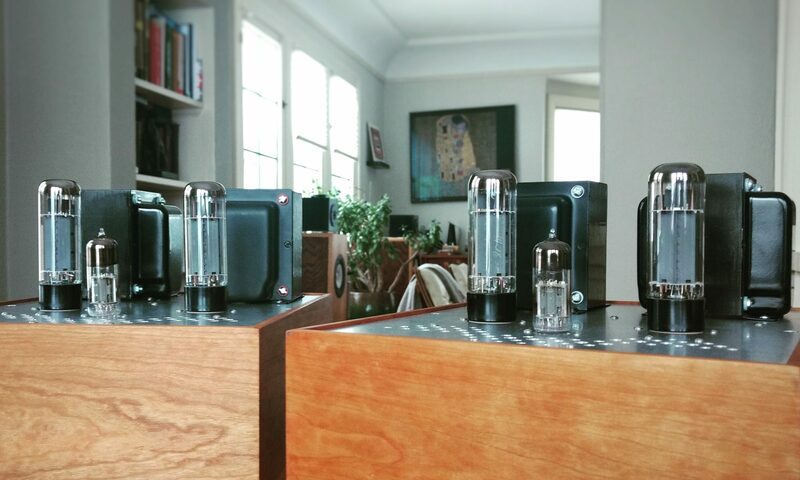 All things being equal, and space and budget allowing, I tend towards tubes because I like the way they look and I like knowing that the high voltage will start up just a little bit slower. All things being equal, others would go for solid state because it has a lower output impedance and allows for larger filter capacitors. There’s more emotion than measurement in either decision. 274B borrowed from thetubestore.com and 1N5408 borrowed from PartsExpress.com. I claim Fair Use here and anyways they can get bent if they don’t like me linking to them in exchange for the pics.